Thick frames and bold colors, you'll stand out plenty wearing our Coffee Shop readers. 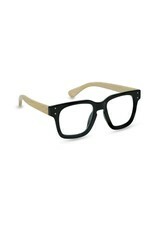 Get the "hipster-look" with these square full frame readers with silver stud embellishments and recycled bamboo arms. Available in black and tortoise frames and designed with spring-hinges for added comfort.